The first round of Go4IT produced four awards – one of which was to Addaction North Somerset. We were delighted to present Addaction with six desktop computers to replace the old ones that were starting to break down. The scheme has provided good reliable and up to date IT facilities for both existing and new users of the services that Addaction delivers. 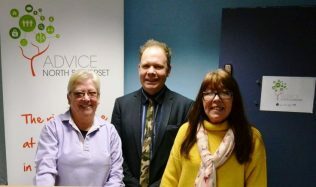 Addaction North Somerset is commissioned to offer a recovery orientated integrated system encompassing medical, psychosocial and social care interventions to adults. In April 2015, Addaction won the contract to provide support to those with drug and/or alcohol dependency issues throughout North Somerset. As a result, the services expanded to not only provide help for people who are recovering from alcohol issues, but also to help those who may have dependency issues associated with prescription drugs and over the counter medicine. With the expansion of the services provided by Addaction, it means that their service delivery will expand rapidly in the near future. Many of these issues that their users will present with will involve needing help with either claiming or finding out about what benefits they may be entitled to. With the movement towards services being digital, it is more important than ever that Addaction have sufficient IT provision to meet this need. Addaction had desktop computers that were used to help their users to gain and improve IT skills, but these were getting to the point that they were no longer functioning. The Go4IT scheme replaced the previous desktop PCs and increased opportunities for users to develop the necessary IT skills. With the services that are offered by Addaction increasing, this was a great time for the Go4IT scheme to come along! What can Go4IT do for you? The next closing date is 22nd May. Find out more here.